Advent is the beginning of the church year for Christians. It is our custom to incorporate Lessons and Carols into our 10:30 worship service on the Second Sunday in Advent. Our Christmas Eve services are: 3:00 p.m. for Very Young Children and their families; 4:30 p.m. Family Service; and 9:00 p.m. Candlelight Choral Eucharist. On Christmas Day, our service is at 10:00 a.m.
Holy Eucharist is celebrated on Wednesdays in Lent at 11:30 a.m. in the chapel. Stations of the Cross are walked Sundays in Lent at 5:00 p.m.
On Maundy Thursday, at 7:00 p.m. the service in the nave will include foot washing. 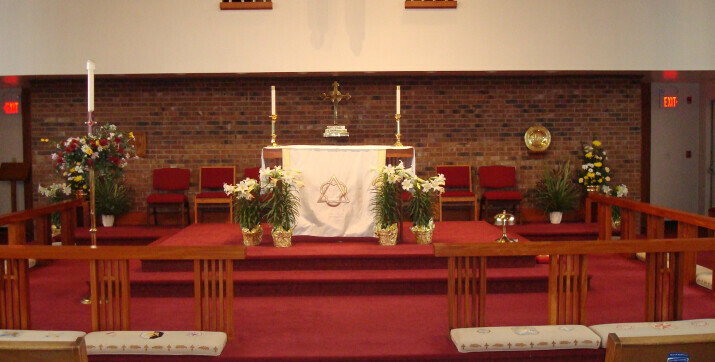 Afterward, we keep vigil at the Altar of Repose in the chapel until Good Friday. On Good Friday, we will have two services: 12:15 p.m. and 7:00 p.m.
Our services will be at 8:00 and 10:30 a.m. All are welcome! Our Annual Parish Picnic takes place on the second Sunday in June and includes a Mass on the Grass at Cerny Park in Warrenville. We celebrate the Feast of St. Michael and All Angels in September. All Saints' Sunday is the first Sunday in November. We celebrate a special Eucharist on the eve of Thanksgiving Day.